Cover art featuring a Nissan Skyline R34 GT-R V·Spec, BMW M5 and Chevrolet Bel Air Sport Coupe 265 V8 escaping from the police. Need for Speed Payback is a racing game set in an open world environment of Fortune Valley (a fictional version of Las Vegas, Nevada). It is focused on "action driving" and has three playable characters (each with different sets of skills) working together to pull off action movie like sequences. In contrast with the previous game, it also features a 24-hour day-night cycle. Unlike the 2015 Need for Speed reboot, Payback includes an offline single-player mode. 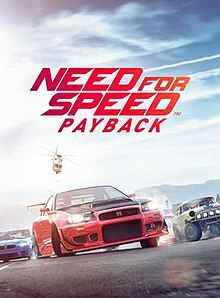 Need for Speed: Payback features a total of 74 vehicles (81 with downloadable content), with all 2015 reboot manufacturers, except Toyota (including the Scion brand) and Ferrari, returning; the aforementioned two manufacturers do not feature in the game due to licensing issues. However, the Subaru BRZ appears in the game. Aston Martin, Audi, Buick, Jaguar, Koenigsegg, Land Rover, Mercury, Mini, Pagani, and Plymouth make a reappearance after their absence from the 2015 installment, while Alfa Romeo, Infiniti, Mini and Pontiac were added via downloadable content. Tyler "Ty" Morgan (Jack Derges), Sean "Mac" McAlister (David Ajala), and Jessica "Jess" Miller (Jessica Madsen) are part of a crew in Silver Rock, Fortune Valley along with their friend and mechanic Ravindra "Rav" Chaudhry (Ramon Tikaram). After a friendly race between them, Tyler's childhood acquaintance and fixer Lina Navarro (Dominique Tipper) arrives, with a job for them: steal a precious Koenigsegg Regera belonging to Marcus "The Gambler" Weir with some high level tech inside. Tyler, posing as a test driver, successfully steals the car and evades the police. However, as he arrives at the drop point, he finds Rav knocked out. Lina appears, revealing that she set up Tyler and his crew to take the fall for the stolen car and she drives away, leaving them at the mercy of the oncoming police force. Tyler leads the cops away from his crew and runs into The Gambler, who demands his car back. On learning that Lina betrayed both of them, Weir is angry and decides to leave Tyler to be arrested, but changes his mind and asks him to come with him so that he can be protected from being arrested. Six months later, Tyler is working as a valet for Weir. As he delivers his car to his casino, Tyler spots Lina threatening Weir to hand over the casino to The House, a cartel who controls Fortune Valley's underworld. Tyler considers going after her, but Weir advises him to bide his time. Frustrated at the lack of progress, he decides to take matters into his own hands. Contacting The House as a racer, he enters a race and wins it, despite Lina having rigged the race for profit. Lina tries to have him taken out, but fails. Weir proposes Tyler a way to take down The House and Lina along with it. Tyler is to enter and win "The Outlaw's Rush", a massive street racing event that has the nation's top racers participating, which The House plans to rig for their own ends. Tyler refuses at first, but when his house is blown up by Lina as a warning, he decides to accept Weir's offer and get his crew back together. Since the failed mission, Mac has hit rock bottom, and has agreed to teach Internet celebrity "HashTiger" how to drift. Rav has decided to go legitimate as a mechanic, and Jess, on her own since the job, now operates as a getaway driver for the Silver Rock criminal underground. However, they agree to meet and hear out Tyler's plan for taking down The House. In order to get into The Outlaw's Rush, Tyler and Mac must take on the street leagues in Fortune Valley to be accepted into the race. Meanwhile, Jess does several escorts and courier deliveries inside The House for a woman only known as The Broker. Tyler takes on and wins against La Catrina and her league, Graveyard Shift, while Mac challenges and wins against Udo Roth and his League 73. Afterwards, they get a chance to perform a heist, reclaiming Weir's Koenigsegg and delivering it back to him. Tyler and Mac then challenge two leagues, Big Sister and her league, Riot Club, and the Underground Soldier and his league, Shift Lock. Jess finds out that Lina is paying off cops and racers alike to do her bidding whenever required, and learns that she and the crew are on the police and The House's watchlist. She also finds out that they are planning to bring something into the city called Skyhammer, and it would be operational soon. Later, Tyler is contacted by La Catrina for a rematch, but on reaching there, he finds Mac and Jess there too, who have been called there on different pretexts. Realizing they have been set up by Navarro, the three are pursued by the police. During the chase, Skyhammer is revealed to be an EMP killswitch placed on the pursuit helicopter which, when activated, is capable of slowing down a car or immobilizing it if focused on for long periods. The three manage to take down the helicopter and escape the cops. Exiled once again by The House, Tyler and Mac continue their quest to gain allies against The House by taking on three more leagues: The Silver Six, led by Tyler's childhood friend "Gallo" Rivera, Noise Bomb, led by Aki Kimura (originally from Need for Speed: ProStreet), and Free Ember Militia, led by Faith Jones. Jess, now inside The House, continues her intel gathering on The House's operations for The Broker. She learns of two gold plated cars fitted with illegal tech that The Collector, the head of The House, is putting on display, and plans to steal them with Tyler and Mac. However, Navarro and The Collector have anticipated this and plant bombs on the cars. With the police in hot pursuit, Mac, Tyler and Rav transport the cars out of town using a semi truck. After smashing through several roadblocks, Tyler and Rav manage to detach the bombs and throw them at the pursuing police cars, ensuring their escape. Jess, going back undercover, learns more about the House's activities with the help of the Underground Soldier, who goes under when his cover is blown. Nevertheless, Jess manages to get the data to The Broker, where she learns The Collector is just a pawn and of something called Arkwright. Meanwhile, Tyler and Mac race against the final three leagues: Mitko Vasilev's Diamond Block, Holtzman's Hazard Company and Natalia "SuperNova" Nova's One Percent Club, all of whom are on The House's payroll. After winning, Tyler and his crew learn they have successfully made it into The Outlaw's Rush. Knowing that Navarro would do anything to ensure that they don't win, Rav outfits the cars with countermeasures that prevent them from being hit by the killswitches, which have been set up on several police cars as well. Tyler decides to run both the street and the off-road races. During the street leg, Navarro sends the league bosses under her payroll to stop him, but they all fail. During the off-road leg, Navarro resorts to sending the cops after Tyler, but all the crews he and Mac have gained as allies intervene by creating multiple distractions across Fortune Valley, to draw away the cops, as well as take down the units chasing Tyler. Left with no option, Navarro decides to race against Tyler herself. During the race, The Collector calls and offers Tyler to replace Navarro as his lieutenant by convincing him to lose the race, but he refuses. Tyler eventually wins The Outlaw's Rush for Silver Rock, while Navarro is left at the mercy of The Collector's thugs for her failure. The game ends with the crew deciding to race each other home. In a post-credits scene, Mr. Kobashi, a customer whom Jess had driven, calls Weir and tells him his gamble worked, and that The Collector is finished. He welcomes Weir to the aforementioned Arkwright and Weir hangs up, satisfied. In January 2016, Ghost Games began development on the next Need for Speed game to be released in 2017. [better source needed] Electronic Arts later confirmed in their January 2017 earnings call that the next game in the franchise was in development and set to be launched during EA's fiscal year 2018 (Comprising from April 2017 to March 2018). The soundtrack features songs by A$AP Ferg, Action Bronson, Barns Courtney, Gorillaz, Jacob Banks, Jaden Smith, Nothing but Thieves, Queens of the Stone Age, Rae Sremmurd, Royal Blood, Run the Jewels, Skepta, Spoon, Post Malone and X Ambassadors. Payback also features DJ Shadow and Nas song "Systematic", which was created for the Mike Judge television series Silicon Valley. Need for Speed Payback received "mixed or average" reviews from critics, according to review aggregator Metacritic. Luke Reilly of IGN praised Electronic Arts for repairing the problems of the game's predecessor, Need for Speed, but criticized its "scripted" story, lack of police chases during free roam, scripted police chases, loot box-like mechanisms during customization, poor car handling, unrealistic car damage and several other issues. PC World criticized the game for being full of microtransactions, the severely limited customizability of cars, gameplay mechanics, a lack of cockpit view and several more issues, and compared it harshly to the Forza Horizon series. According to The NPD Group, Payback was the eighth best-selling title in the United States for the month of November 2017. ^ McCormick, Rich (June 2, 2017). "EA's new Need for Speed: Payback looks very fast and fairly furious". The Verge. Retrieved June 2, 2017. ^ Reilly, Luke (June 2, 2017). "Need For Speed Payback Looks Faster, More Furious". IGN. Retrieved June 5, 2017. ^ Yin-Poole, Wesley (May 10, 2017). "The New Need for Speed Lets You Play Single-Player Offline". Eurogamer. Retrieved June 5, 2017. ^ "Toyota's absence from the game was confirmed on Reddit". ^ "Under the Hood #7". Ghost Games. Retrieved 10 May 2016. ^ a b "Need for Speed Payback for PC Reviews". Metacritic. CBS Interactive. Retrieved November 6, 2017. ^ a b "Need for Speed Payback for PlayStation 4 Reviews". Metacritic. CBS Interactive. Retrieved November 6, 2017. ^ a b "Need for Speed Payback for Xbox One Reviews". Metacritic. Retrieved November 6, 2017. ^ Carsillo, Ray (November 7, 2017). "Need for Speed Payback review". Electronic Gaming Monthly. EGM Media, LLC. Retrieved November 7, 2017. ^ Wakeling, Richard (November 6, 2017). "Need for Speed Payback Review". GameSpot. CBS Interactive. Retrieved November 6, 2017. ^ Loveridge, Sam (November 7, 2017). "Need for Speed Payback review: "Silly, over the top and a little bit self-indulgent, but in a fantastic action movie way."". GamesRadar. Future plc. Retrieved November 7, 2017. ^ a b Reilly, Luke (November 6, 2017). "Need for Speed Payback Review". IGN. Ziff Davis. Retrieved November 6, 2017. ^ Good, Owen S. (November 11, 2017). "Need for Speed Payback review". Polygon. Vox Media. Retrieved November 11, 2017. ^ Dingman, Hayden (November 10, 2017). "Need for Speed: Payback review: Pouring loot boxes on a tire fire". PC World. International Data Group. Retrieved December 3, 2017. ^ Makuch, Eddie (December 14, 2017). "Top 20 Best-Selling Games In The US For November 2017". GameSpot. CBS Interactive. ^ "Game Critics Awards: Best of E3 2017 (2017 Nominees)". Game Critics Awards. Retrieved February 19, 2018. ^ Khan, Zubi (August 21, 2017). "Gamescom 2017 Award Nominees". CGM. Retrieved February 19, 2018. ^ "Nominee List for 2017".